My Granny was friends with everyone she ever met. Before I was even school age, we frequented the local shopping mall. She called this “bummin’”, meaning to wander and window shop. I have never heard that phrase used in that way by anyone outside our family. At the mall, she talked to the clerk at the perfume counter. While waiting for the elevator, she would chat up the young mom with a child-filled stroller. If you asked her, “Who was that, Granny?” She would say, “Oh, I don’t know.” She just liked to talk and be friendly. The highlight of each shopping trip for me was stopping at the center candy kiosk and watching the taffy pull machine. It would spin, stretch and rotate the slick sweetness into a glossy marvel. It was reliable and continuous. Another favorite spot was the ZCMI department store where Granny would smile at the woman behind the counter and ask for a quarter-pound of circus animal cookies. I would watch anxiously as the metal scoop dipped into the sprinkle-covered pink and white treats, which were then shuffled onto the scale, and finally ladled into a small white bag for me to take home. Granny looked after me nearly every day while my mom worked and my dad finished getting his degree. Most days, she would pick me up at the Challenger School around the block from her house, and we would walk together pointing out favorite trees or barking dogs. She was the master of games. I learned to play hide-and-seek at her house, avoiding the basement cellar as a hiding place because my Uncle Jay told us that’s where the giant lived. The best place to hide was her coat closet. The coats and sweaters smelled like her embrace and the Wrigley’s gum she always kept in her purse. She taught me how to play checkers and she used sound effects like, “whooop” and “wooooo” as the pieces jumped one another and made their way to the final row to be kinged. One of her favorite games was a memory game called Hüsker Dü?. The board is a large square, and flat blue game pieces cover circular dots which are home to various pictures: pine trees, snowflakes, cars, bells. Once all the pictures are covered, an underlying wheel is rotated to shuffle the pictures, and whoever uncovers the greatest number of matches wins. She was a patient teacher and probably let me win more than was healthy for my competitive nature. Some of the first nursery rhymes I learned were spoken by my Granny. She would read the cover, “Mother Goose’s Nursery Rhymes” and then turn the pages to “Peter, Peter Pumpkin Eater” or “Hey, Diddle Diddle”. She had the best inflection and would do voices for each character. 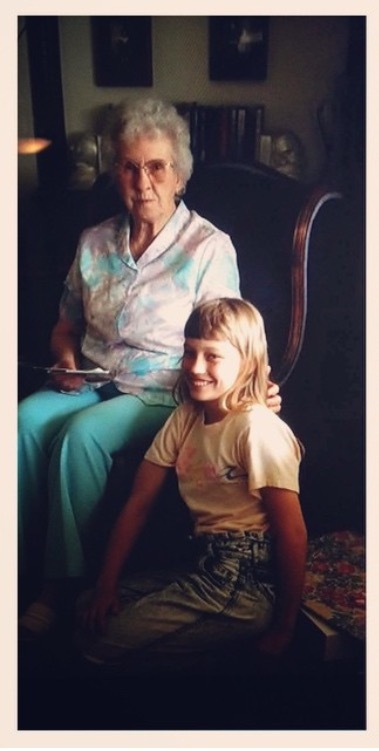 My sister Melissa and I often talk in voice-over type voices, even today, and it can surely be traced back to sitting in the yellow recliner at Granny’s house and listening to her read to us. I always wanted my Granny to draw pictures for me. She would sketch little girls with curly hair and tight-lipped smiles, which greatly resembled her own. From a young age, I always wanted to be an artist, so when Granny was in her 70s and took a canvas painting class at a local center, I was deeply impressed when she brought home oil paintings of barns, pink-blossomed trees, and fields of green grass. I would run my fingers over the dried paint to feel the texture. There was no one who was a better baker than my Granny. She may have used recipes, but I don’t recall ever seeing one in front of her. For family events, which were frequent in our large, extended family, there was always a Texas Sheet Cake with glistening chocolate frosting topped with walnuts. At Christmastime, she would keep soft, iced, homemade gingerbread men in a wax paper-lined, gold Tupperware container. It was always tucked away on the bottom shelf, but sniffing it out was my expertise. Sleepovers at her house were a coveted event. I loved taking baths in her tub, because she had a large scrub brush that could reach the lowest part of my back and the fizzy salts smelled like flowers. She would often let me sleep in her bed on her silk pillowcases. She made waffles in the mornings, and would let me eat them with Karo Syrup (straight corn syrup). Her freezer always contained Jell-O Pudding Pops and the fridge housed a quart of crangrape juice. If we were drinking orange juice; she would defrost the concentrate, mix it up with a wooden spoon, and then let me use a mini-strainer to filter out the pulp. My parents would never have possessed the patience to let me make my own pulp-free orange juice, so this was a luxury. One of Granny’s frequent sayings was, “I love doing dishes.” This is apparently not a genetic quality that I inherited, as I view dishes as an endless pain. Granny didn’t have an automatic dishwasher, so she would fill the sink with scalding water, and would scrub the dishes while I rinsed them. She never pre-rinsed any plates or bowls, so dish-doing was akin to fishing in a basin of leftovers. She was unphased by both the floaters and the 120-degree water. The backyard and surrounding garden was one of Granny’s favorite places. She liked the feel of her hands in the soil, and she would take her orange kneeling pad out to the edge of the grass and trowel in the soil, pulling weeds and planting little flowers. On the west side of the yard, a gigantic lilac bush gave off a fragrance that filled the air each spring. When she would dig up an earthworm or potato bug, she would let out a little giggle when my younger sister Melissa cupped her hands to hold them, something I never dared do. You learned early in life to never say you were bored at Granny’s house. When that utterance was made, she immediately put you to work. “I’ll give you a quarter to clean out my cupboards. You’re just the right size to get back in there,” she would say. She’d have you clear everything out of her cupboards, hand you a damp, warm rag and you’d have to shimmy to the back corners of the cupboard to wipe it clean. Then a dry cloth was used to wipe some more. Finally, everything was put back into the cupboards. She must have had the cleanest cupboards in all of Utah County. Granny’s vacuum was a wonder to me. It wasn’t an upright vacuum like you’d typically see today. It was a canister vacuum, with the hose and the handle that was pushed to clean the floor coming out of the canister like an elephant’s trunk. I still love vacuuming to this day, and I think it can all be traced back to the days I spent operating this unique-looking contraption at my Granny’s house. In her bedroom on her ancient-looking dresser, was my Granny’s jewelry cabinet. She must have been extremely trusting, because she would often let my sisters and me go into her bedroom alone and spend time with her jewelry. The little doors to the cabinet would unlatch and little drawers pulled open to reveal the rings and earrings inside. We would try them on, sort them, and pick out our favorites. In the guest bedroom, there were trophies and books on the shelves. My grandfather passed away about a decade before I was born. He raced boats and flew airplanes. Several of his boat racing trophies were on the shelves, along with a couple bowling trophies from Granny’s triumphs at the lanes. There was an unauthorized Elvis autobiography which I found fascinating and liked to leaf through. My Granny’s sister, my Great Aunt Armanell, had once gone to the Bahamas and brought back seashells. The largest one sat on a shelf among the trophies. I used to prop it to my ear to hear the sea. One of the only times I remember being frustrated at her house, was when the neighborhood kids would call her “Grandma”, because she wasn’t their Grandma. She was mine. But in retrospect, I can see how she was their Grandma too. After all, she was friends with everyone she ever met.